Bollywood actress Sunny Leone, who is currently busy hosting Splitsvilla 11, has today, January 28, took to Instagram to share her couple of pictures with Rannvijay Singh. In the pictures, she is seen being a Marvel superhero and defeating the latter as she punches him. 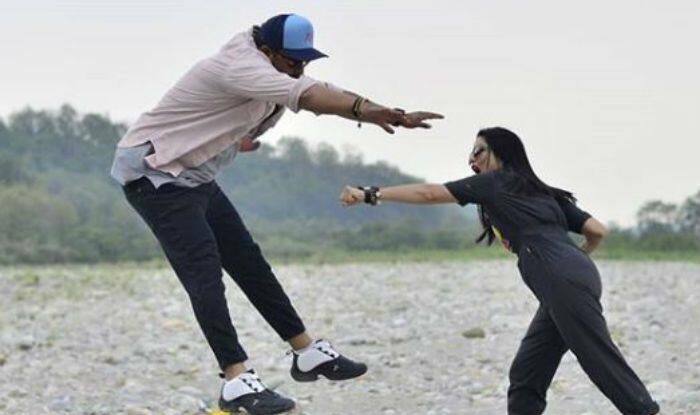 The picture is hilarious and shows the energy of both stars on the sets of the reality show. While Sunny is seen donning a Marvel Comics-inspired grey jumpsuit, Rannvijay sports a casual look teamed up with a cap and sports shoes. As per the description in the post, she gives us the hint that she is interested to work in an Indian Marvel superhero movie and we can’t agree with her more. Lately, the actress has been in news for not returning Rs 5 lakh signing amount by Patel Ki Punjabi Shaadi produced by Bharat Patel. As per the reports, she has failed to return the amount that she has taken to do a special dance number. Bharat said in a statement, “According to the deal, Sunny was supposed to be paid a total of Rs 40 lakh for the song – Rs 5 lakh as signing amount, Rs 5 lakh after the look test, Rs 10 lakh during the rehearsals and the remaining Rs 10 lakh during the promotions. Sunny was paid Rs 5 lakh as the signing amount but after that when she was called to discuss the dates with the other actors and the other details that needed to be finalised before the shoot, she did not respond to the production team’s calls and messages”. However, Sunny has till now not come out to speak on the matter.